It's a Soil Cube Giveaway Contest! It’s a Soil Cube Giveaway Contest! So last week I did a post about why we should all start planning our spring gardens right now. 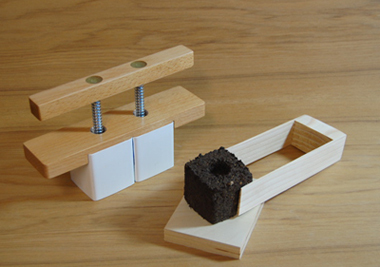 And in that post I featured a really awesome, eco-friendly tool that makes perfectly square soil cubes for starting seeds in. Well Clayton, the owner and inventor of Soil Cube, has graciously agreed to sponsor a contest here at The Greenest Dollar. Yahoo! If you’ve ever started seeds yourself, then you know how delicate baby plants are. And moving them to their permanent home (to a garden or container) is tricky…some gardeners will lose 50% or more of their plantings during this process due to root shock or stem breakage. I know I lost plenty of plants last spring when it came time to replant them. 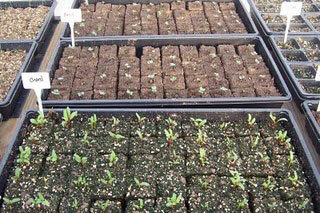 Soil cubes permit more plants per square foot than round peat pots anyway. Another benefit to the Soil Cube? If you don’t win (and end up buying one for yourself) you’re supporting a family, not some big corporation. Clayton makes all his Soil Cubes by hand. So, you’re helping support him and his family. That’s always a huge bonus for me! So, ready to win a Soil Cube for your own spring garden? Yay! Contest runs from 12/13 through 12/23. On 12/24, I’ll use Random.org to pick one lucky winner. 1. Leave a comment on this post telling me what you’d love to plant with your Soil Cube. 2. Spread the word about this contest on Twitter. Come back to this post and leave a comment, with your Twitter ID, so I can follow you back. You can spread the word once per day on Twitter, but make sure you leave a new comment each day with your Twitter link. 3. Spread the word about this contest on Facebook. Leave a comment on this post letting me know you spread the word to your own friends. And that’s it! Good luck everyone! Important: Please enter a valid email address when you leave a comment, since that’s how I’ll contact you to let you know you won! And, don’t worry about getting SPAM from me or anyone else for entering. I hate SPAM too- it won’t happen. How cool! I would be thrilled to have a soil blocker. It’s one of those things I keep thinking I’ll do. i would plant some cabbage with my soil cube. i cannot get enough of it! i would plant some cabbage w my soil cube. i can’t get enough! I’d plant just about everything except carrots with this (I’ve been thinking of buying a multiple cube maker.) Tomatoes, beets, broccoli, herbs, onions, leeks…. I’d love to plant a delicious herb garden, peppers, garlic, beans, and heirloom tomatoes. This would give me an incentive to start from seeds this year. I have a bunch of seeds from plants I let go to seed in 2010 and would love to plant for 2011. I’ve also learned early spring veggies definitely need something like this and I would attempt to plant them again with a tool like this. I want to start my lettuce varieties in the cubes so I can have fresh greens even earlier than I do now. I would plant peppers with my soil cube! I love gardening! Thanks! I would love to win a Soil Cube. I tried growing seeds from scratch this year and it didn’t go so well. Hopefully this handy little device would improve things. That is just totally awesome!!! I would love to have a soil cube – last year I was using all recycled material to plant my garden – this would cut out all of that – that would be so much easier! I live in AZ and my husband and I really want to have a great Spring garden. Trying to eat healthy on a budget is really hard so our best bet is to grow our own food. It tastes so much better that way! This soil cube would be great because we love to start from seeds. I would love to plant all sorts or veggie babies with this fantastic tool. Green beans, tomatoes, squash and several varieties of lettuce. It would be awesome! I’d love a soil cube I want to pant a green’s garde kale,lettuce argula all kinds of greens and a herb garden too. I really want one! Thank you! What a nifty little thing! I would love to be able to start my seeds earlier (ie inside) this year instead of waiting until it was warm enough to plant outside. Herbs (esp. basil), peppers and spinach would definitely be on my list. I would love to win the Soil Cube. I’ve never seen any thing like this. I would love to be able to start my own seedlings instead of buying them. Swiss Chard… I’m planning on growing some this upcoming spring. I make “green smoothies” during the week and want to grow some of my own greens. Twittering this soil cube goodie too! The soil blocker looks like a handy gardening tool. I would love to win one! I have been using seeds more and more to complete my garden each year and to keep the cost down. now,this something i will have either wining or buying! How cool. This little tool would encourage me to start my vegetable from seed this year. My kids would love to use this tool to help w/ the spring seed starting. I’d love to plant some herbs! Nothing better than fresh herbs for the kitchen! I grow gourds every year and make birdhouses out of them. I like to start them early inside because of their long growing season. This would be perfect for when I transfer my plants outside. I’d love to get one of these! I’d like to plant organic lettuce. I would love to start some tomato seeds inside this year using a soil cube. Last year’s batch was a bit of a disaster! I would plant tomatoes and flowers.